With its deliberately restrictive controls and idiosyncratic style, this plugin requires a new approach but sounds brilliant. Unique design. Easy to use. Well-tuned high shelves. Crystal clear parallel sound. Listening-focused workflow. Classy, 'expensive' results. Interface could be improved. Full Frequency switch is missing. Kush Audio first forged a reputation in the hardware domain, only recently breaking into the native plugin market with the excellent UBK-1 character compressor. Clariphonic DSP is a parallel high- shelving equaliser plugin (VST/AU/RTAS) coded by Studio Devil, and it marks Kush's second software release and the first software incarnation of one of its hardware units. "The Kush design philosophy leans towards intuitive workflow and high-quality sound rather than surgical tweakability"
To describe Clariphonic DSP as simply an EQ would be inaccurate and unfair since it stands alone, both sonically and in terms of usage/ operation. The Kush design philosophy leans towards intuitive workflow and high-quality sound rather than surgical tweakability. 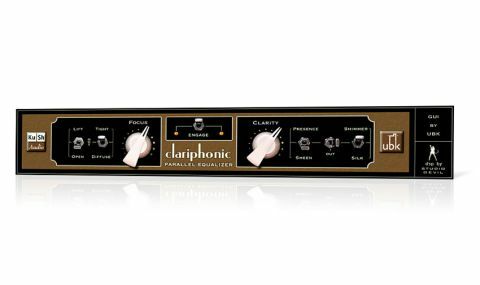 The Clariphonic DSP interface is effectively split into two engines: the Focus engine on the left-hand side and the Clarity engine on the right, each featuring a single high-shelf filter. Central to each engine are the (boost-only) gain knobs, named Focus and Clarity, respectively. The corner frequency settings that these boost are labelled using adjectives rather than clinical measurements, so, for example, the Focus engine gives you the choice of Lift and Open, rather than actual numbered frequencies. The Lift band is the lowest band on offer, starting to kick in around the lower midrange. The Open band heads higher up, covering a slightly sharper area somewhere around 3kHz. Once you've selected the band you want to adjust, you can pick one of two shelving curves. The Tight curve tapers off slightly over 10kHz to produce a smoothed response in the top frequency octave, while the Diffuse curve plateaus for a comparatively brighter shelf. The Clarity engine offers a choice of four more bands, firmly situated in the treble range: Presence, Sheen, Shimmer and Silk. The highest of these is at an extraordinary 39kHz, the top corner of which is obviously well out of the range of human hearing; but, according to Kush, because the filter is so broad and gentle, the lower corner reaches well down into audibility. "It became immediately obvious to us that the sound we're dealing with here is in a class of its own"
Testing it on vocals, drums, guitars and synths, it became immediately obvious to us that the sound we're dealing with here is in a class of its own. Clariphonic DSP feels like a treble enhancer in the sense that it appears to bring out all the finest non-bass details of the source material, but it does so with none of the distortion or harshness of your typical enhancer. How does it stack up feature-wise to the original Clariphonic box? Well, the hardware comprises two independent channels, requiring you to tweak both the left and right sides, while the plugin works in either stereo or mono mode with one set of controls. The Full Frequency switch is missing from the plugin, so it's not possible to hear only what the filters are doing without the original source mixed in. Clariphonic DSP can brighten up anything from spoken dialogue to instrument tracks, busses and entire mixes in a truly unique way. It goes way beyond the sonic attributes of a regular EQ, offering extremely transparent control of the top end via an intuitive and pleasing workflow. Whatever style of music you're making, this tool is likely to help you quickly achieve a refined, polished sound.